WASHINGTON — Seven years ago, newly elected President Barack Obama came to a blighted stretch of northern Indiana and predicted a tough but certain recovery — if the country embraced his approach to re-juicing the economy. He returns Wednesday seeking credit for having lifted the U.S. out of the doldrums with policies Democrats are now rallying behind as they work to elect his replacement. Obama’s appearance — his eighth in Indiana since being elected — could be viewed as an early foray into the 2016 campaign. In excerpts of his remarks released before his speech, Obama cast the election as a choice between the paths that Democrats and Republicans want to take on the economy. “If what you really care about in this election is your pocketbook, if what you’re concerned about is who will look out for the interests of working people and grow the middle class, then the debate isn’t even close,” Obama said. In Elkhart, a town of about 50,000 not far from South Bend, Obama will encounter a community whose experience during his presidency has mirrored the country’s broader economic revival: uneven and bumpy, with both winners and losers. Though the job market has picked up and Elkhart’s housing crisis has ebbed, the area has fallen short in its aspirations to diversify beyond its reliance on the niche recreational vehicle industry. On the campaign trail, Donald Trump has hammered Obama over free trade policies that Trump blames for air conditioning manufacturer Carrier Corp.’s decision to ship 1,400 jobs from Indianapolis to Mexico. To Obama, who has often held up Elkhart as a microcosm of the U.S., those lingering challenges aren’t enough to forestall a planned victory lap on the economy. 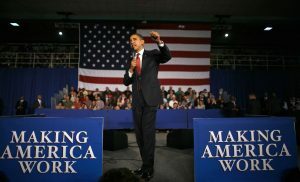 Arguing that his controversial $840 billion stimulus package was ultimately vindicated, Obama will call on the next president to be willing to spend big to enable further economic growth despite the objections of small-government conservatives. “If we get cynical and just vote our fears, or don’t vote at all, we won’t build on the progress we’ve started,” Obama planned to say. Obama and his aides have long signaled frustration that as the economy has improved, the public’s perception of his decision-making hasn’t tracked the same trajectory. The White House sees his opponents’ begrudging refusal to give credit where due as a symptom of their decision early on to reflexively oppose all of his ideas. Elkhart County Commissioner Mike Yoder, a Republican, paused for 15 seconds and laughed when asked whether Obama deserved any credit for the recovery. He said government plays a role, but that politicians must be cautious not to overinflate their contribution. “At the bottom of the day, I think most elected officials — and I’m guessing the president would say this himself — that it is the local communities and the local businesses and workers that really are the major reason that a community will turn around,” Yoder said. In Elkhart, where unemployment hit 19.6 percent at its peak during the recession, joblessness has dropped precipitously to about 4 percent — lower than the national average. The foreclosure rate, too, has diminished, and manufacturing has picked up. Still, it is places like Elkhart that illustrate just how stubborn opposition to the president can be — especially in conservative stretches of the Midwest. Though Obama won Indiana in 2008 in a shocking victory, he lost the traditionally Republican state decisively in 2012. In late April, ahead of Indiana’s primaries, just 42 percent of Indiana adults in an NBC News/Wall Street Journal/Marist poll said they approved of the job Obama’s doing. That’s lower than his approval in the country as a whole. A few weeks later, 51 percent in an NBC News/Wall Street Journal poll said they approve, in line with other recent surveys. Indiana’s Republican governor, Mike Pence, said Wednesday that Elkhart had rebounded “in spite of Obama’s policies” and that those policies inflicted onerous federal burdens on Indiana. “There are many reasons for the remarkable economic recovery that has been created in Indiana but I believe most of the credit belongs to the hard-working people of this community and the state,” Pence wrote in an editorial in the Elkhart Truth. Neither Pence nor his re-election opponent, Democrat John Gregg, planned to attend Obama’s speech. For Democrats, Obama’s renewed popularity nationally is enough that the party is firmly embracing his policies in the presidential election, especially on the economy. Hillary Clinton has proposed steps that build directly on Obama’s actions while Bernie Sanders has praised his accomplishments. The notable exception is free trade, where both Clinton and Sanders say they disagree with Obama. Associated Press reporter Josh Lederman wrote this story. AP News Survey Specialist Emily Swanson in Washington and Associated Press writer Tom Coyne in Elkhart, Indiana, contributed to this report.